Congratulations go to Ted & Renay Murdock at 5016 W Oak Highland Drive for being the April 2019 Yard of the Month. This year they removed all the large shrubs in front of the house and replaced them with new bushes and fresh mulch. The updated look and the beautiful flowers made this the April 2019 Yard of the Month! 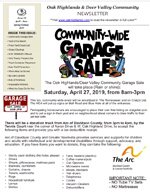 The Oak Highlands/Deer Valley Community Garage Sale is scheduled for Saturday, April 27, 2019, from 8am to 3pm. Take this opportunity to clean out your garage or get good deals on great stuff! Read the latest edition of Oak Highlands / Deer Valley Newsletter in full color, with handy-dandy links included! The Oak Highlands/Deer Valley Homeowners' Association has initiated a Neighborhood Watch Program. This program is a network of interested friends and neighbors looking out for each other. We are neighbors helping neighbors. We are registered with Nashville Metro Police and sanctioned by the OH/DV Homowners' Association Board of Directors. Membership is 100% FREE and completely voluntary. We hope you will join us! Orchard Park & Deer Valley Street Lights & Metro Trash Collection- Coming Soon! Orchard Park and Greenway, located on Pettus Road, at the end of Blue Hole Road, is set to open before the end of 2018. In addition, new street lights are also planned for the remainder of Deer Valley! To view pictures of what these new amenities will look like and where they will be located, please view the full article. For those wondering what is being built on the corner of Blue Hole Road and Bell Road, the answer is Millwood Commons Apartment Complex. The Planned Urban Development (PUD) for this type of development was originally approved back in 1996. This phase includes 336 apartments. The entrance to these apartments will be on Bell Road. There is an emergency access road on Blue Hole Road. The Blue Hole Road access will be locked for normal operations. If you are a resident of Oak Highlands or Deer Valley and would like to go for a nice walk, head down to our walking trail! To find our walking trail go to East Oak Highland Drive. Turn left on Brian Circle. You'll find the paved walking trail entrance between 173 and 177 Brian Circle. If you bring your dog, remember to bring bags so you can clean up after your pet. The board has received several complaints about people parking on the streets. Complaints have come in for Aaron Drive, Deer Valley Trail, Brian Circle, Canoe Ridge Point, Copper Ridge Trail, Pinot Chase, Streamdale Point, and West Oak Highland Drive. The concerns are valid. Parking on the street causes decreased visibility and in some cases, when cars are parked on both sides of the street makes it impossible for emergency vehicles to get through. What can you do to help? Don't Dump Grass, Limbs or Leaves! Did you know that if your yard waste ends up in a drainage ditch you could be fined $50 by the HOA?! That's right. There is a "NO DUMPING" rule in our neighborhood. Grass clippings, limbs and leaves that get dumped in the "woods" behind your home and end up in the drainage ditches will clog the drainage pipes and could cause flooding to near by homes. DO NOT DUMP!! Your neighbors down stream will probably notice, get tired of cleaning up after you and will most likely report you.